This post originally appeared on Next Billion. If you are a pregnant woman in the Upper East region of Ghana who has registered with MOTECH, you will receive this message during the fifth week of your pregnancy. 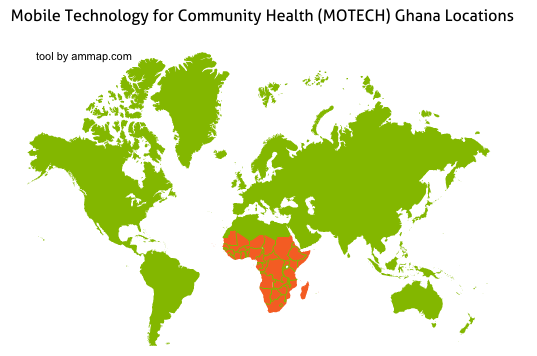 Started in 2009, MOTECH is an mHealth platform created in partnership between the Ghana Health Service, Grameen Foundation, and Columbia Mailman Public Health School, with funding from the Bill and Melinda Gates Foundation. It is designed to facilitate better medical information dissemination to rural areas and improve operational efficiency at community- and district-level health centers in one of the poorest regions of the country. MOTECH is currently in its pilot phase, with plans to expand throughout Ghana in the future. The Upper East is one of the smallest and least urbanized regions in Ghana, with 85 percent of the population living in dispersed communities throughout the rural areas. The low population density and infrastructure barriers create a challenge for health care delivery, necessitating a community-based approach. Over the past decade or so, Ghana has been operating its CHPS (Community Health Planning and Services) program, which utilizes traditional institutions and social networks with support from outreach nurses employed by the Ministry of Health to reach as many people in the rural areas as possible. It is on these CHPS centers and the nurses who work there, in particular, that MOTECH focuses its efforts. I had the opportunity to visit a few of the CHPS centers myself with Williams Kwarah, the program officer for Grameen Foundation in Ghana. Together we visited a few of the nurses and I asked them about the system. MOTECH offers two main applications: mobile midwives and the nurse application. For mobile midwives, pregnant women and their families register for the service through the CHPS centers. They receive weekly time-specific messages about their pregnancy, including alerts and reminders regarding visits to the local CHPS center, actionable information and advice about best practices, and educational info to ensure a healthy pregnancy. MOTECH customers have the option of receiving messages via SMS or voice, though, due to the low literacy rate in the region, 99 percent opt for voice. Text messages are sent at a set time, three times a week. The voice messages are sent at a time specified by the women. If for some reason they miss the call, the women can “flash” the system (call and quickly hang up to avoid charges), and MOTECH will immediately call back, ask for the patient ID number, and deliver the message to the client. The pre-written script provides pre-natal information for 42 weeks and the first week of life of the baby. MOTECH is increasing the frequency to include the first year of the life of the baby. The nurse application allows the CHPS centers in the rural areas to collect patient data via mobile phone and update the medical records via SMS. Each patient is given a MOTECH ID number. The nurse collects the data and uploads it to the MOTECH system, which stores the information in a central patient electronic medical records system (EMR). The system analyzes the patient data against a clinical regimen and the medical staff develops a program based on the protocols of the Ghana Health Service. The patients are then sent messages based on the schedule, similar to the mobile midwives program. For children under five, the parents receive reminders on tetanus vaccination and immunization schedules, while recent mothers receive information on post-natal care for mothers and babies. The nurse application also offers a robust electronic reporting tool that is designed to replace the old system of pencil and paper. Nurses are required to submit monthly reports detailing all patient visitations to the sub-district supervisors and the district health management team in their areas. The manual reporting process is time intensive, consuming up to two days each month. With the MOTECH system, nurses enter the data into the phone at the time of visitation, and it is stored and submitted to the EMR in bulk (each entry takes up less than 1 KB). At the end of the month, MOTECH generates an electronic report and submits it to the sub-district supervisor, who delivers the hard copy to the nurses at CHPS centers for verification. After three months of 85 percent accuracy, the nurses no longer need to produce manual reports. What used to take two days now takes ten minutes. In addition, the nurse application sends reminders to the nurses themselves about patients who are overdue for a consultation. Because the system tracks the schedule of immunizations, for example, it automatically alerts the nurses when a mother is late in bringing her child to the CHPS center. Based on this data, they can schedule a home visit to ensure that the proper care is administered. Many mHealth programs try to improve the efficiency of their systems and maximize the impact of medical professionals serving rural areas. Telemedicine, for example, allows doctors to see patients from a distance. Through its nurse application, MOTECH increases efficiency, to be sure. But it also gets patients to think consciously about their health. By maintaining a weekly connection with the patient and getting them to actively contemplate their health, it makes them more likely to visit the CHPS center, regardless of whether they are told to do so by the system. Through constant communication, MOTECH can change the way people think about their own health and the health of their families. MOTECH is currently in a pilot phase, and has had to adapt the system to fit the cultural context. As a result, its evolved over time, and shared many of the lessons learned recent report. The program is not without its shortcomings. For one thing, the cost of sending SMS and voice messages and distributing handsets to nurses currently subsidized. Sustainability of the project will depend on finding funding to maintain the system and pay for the communications costs. It certainly will be an mHealth program to watch in the future, as it is potentially a scalable model applicable to rural areas around the world. How Does Corruption in the Education Sector Work? Great, mHealth now starting with good stakeholder analysis and community engagement.